Last week on Build, we shared why instead of rebuilding or redesigning an existing product, it might make sense to build a brand-new product, and we walked you through how some folks on the Pivotal Tracker team arrived at their decision. When you start building a new product, you have the best of intentions to revise old processes and move away from bad habits. But it’s easier said than done. So this week, we’re going to share some best practices for keeping a new product on track! And to help us out, Lisa Doan and Vera Reynolds are back! You’ll recall Lisa is a product manager, and Vera is a software engineer at Pivotal Tracker. Poornima Vijayashanker: In the last episode of Build, we talked about why, instead of doing a rebuild, or a redesign, it may make sense to build a brand new product for your company. If you missed that episode, I’ve included a link to it below this video. In today’s episode, we’re gonna dive into some of the best practices for keeping that new product on track. So, stay tuned. Welcome to Build, brought to you by Pivotal Tracker. I’m your host, Poornima Vijayashanker. In each episode of Build, innovators and I debunk a number of myths and misconceptions, related to building the products, companies, and your career in tech. 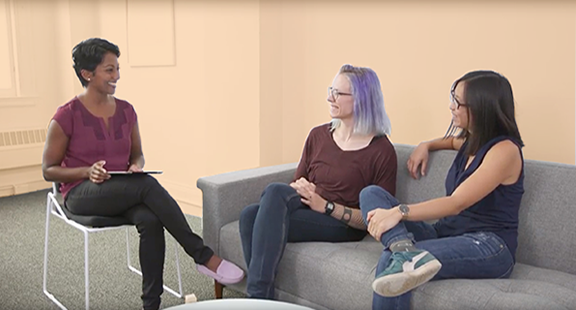 In today’s episode, we’re gonna be sharing a number of best practices to keep a new product on track, as you’re building it, and to help us out, I’ve invited Lisa Doan, who is a Product Manager at Pivotal Tracker, as well as, Vera Reynolds, who is a Software Engineer. Thanks for coming back on the show, Ladies. Lisa Doan: Thanks. Happy to be here. Poornima Vijayashanker: Yeah. Let’s do a quick recap from the last episode on why you decided, instead of doing a rebuild or a redesign, to build a new product. Vera Reynolds: Yeah. So, initially we thought we were just gonna rebuild Tracker, and when we went out in to the world, we realized that the problem space was just way too big and that net was cast too wide and so we need to follow the pain and find what were the most effective things we solve for our users. You have to understand that Tracker does what it does well. They are other competitors, absolutely, I’m not here to toot my own horn but it’s a pretty good product. And so we found that there are other problem spaces that we could talk that are adjacent to Tracker that could complement it in a nice way and so that’s we ended up where we are. Poornima Vijayashanker: OK, so whenever we have the chance to build something brand new we want to start with the best practices, new best practices. I’m sure you’ve both experience this as well as you were assembling your team. What were some best practices and how did you go about learning them. Lisa Doan: So on the product side we had to adopt a lot of new practices. So when Tracker was built back in 2006, product was less of a thing but since then, things like lean startup have emerged, lean product, user centered design and we needed to catch up on those things. And so we brought in an innovation coach who helped us learn how to do experiments and really think about product in a lean fashion. And so we’ve been doing a lot of practices around that. Poornima Vijayashanker: So how did that come about or what did that look like? Lisa Doan: Sure, so when she arrived we had been doing endless research and so she recognized that we were paralyzed and that the first thing we needed to do was pick a direction and that’s what the mission and vision were tools to help us do. Where they came from is, the designer and myself had done plenty of research in the years prior about what the major problems our users were facing on Tracker. And so we had a couple ideas of what we wanted to address with the new tool and so those were incorporated during a workshop where everybody on the team was throwing out their ideas and what they wanted this new tool to be, how they wanted to solve problems for users. And after, I think a whole morning of just workshopping it over and over we finally arrived at a mission that everybody could really agree on. Poornima Vijayashanker: So what was the mission that came out of this? Vera Reynolds: I’m gonna paraphrase it a little bit. Our missions to empower individual contributors on a team to align around shared goals. Poornima Vijayashanker: So I’ve heard you through around user centric a lot. It seems like it’s a new direction that you’re going in. How is this different from what you were doing before with agile. Lisa Doan: Tracker was born by engineers for engineers and for the majority of our span as a team, we’ve been a very engineering centered. A lot of our leadership is former engineers who worked on the project. All of our product manager back in the day were extremely technical. I was the least technical PM and I have a degree in computer science. And so we always had this mindset of doing the best engineering possible but we were less focused than we should have been on what our user needs were and that’s been a huge cultural shift that we’ve tried to instigate with our new team, which is, let’s think about the user first. Let’s always question why we would build something before we build and that’s a muscle that we’ve really had to really grow and exercise a lot is, rather than just coming up with an idea and just immediately building it is, let’s go make sure this solves the user problems, validate that the user actually has this problem. And just really having a discipline around that. Poornima Vijayashanker: Is that because the user is different so maybe you’re not dogfooding it as much as a builder. Vera Reynolds: We do actually dog food our current product. So that was one of the first, we were our own first user and I do think that helps with keeping that front of mind, but as an engineer, I’ve always been getting used to getting candid stories, not so much asking about why we were doing it. It may have been my experience but from what we’ve learned from our users, that’s not unique and there’s not necessarily anything wrong with that, however we feel like a balanced team where everybody is involved and has is user centric to pull it up again, provides the better product. Poornima Vijayashanker: So let’s talk about those balanced teams next ‘cause I think that’s the thing that’s new to right, in your approach. What’s a balanced team. Lisa Doan: So we like to think about it in terms of three spheres of influence, and so you have a sphere that’s very concerned with the user, and so typically that falls to a designer. And then we have the sphere that’s concerned with the business and so typically the product manager has been responsible for that. And then we have the engineering side, who’s concerned about, usability, who’s concerned about building, using the best patterns. And so balanced team isn’t about specific roles and filling them but it’s that, at any given time someone can weigh in for each of those spheres. And so at some point, whenever you’re making a key decision, someone should be able to represent the user, someone should be able to represent the business and someone should be able to think about technical fusibility and the engineering impact of that. Poornima Vijayashanker: Got it. So as you’re moving forward and building this product, you have each of those spheres weighing in on the decision. Lisa Doan: Iteration planning meeting. Lisa Doan: And so as a team will go through the stories that are coming up next and talk about any concerns that we might have. A good example of that now is, sometimes I’ll bring a story to the team, and the engineers are capable of challenging me and saying OK, what is the evidence that we should actually build this. Whereas before the engineers were like, “OK, we’ll build it.” But there wasn’t that conversation about what is this actually doing for the user. So it has great impact that we see. Poornima Vijayashanker: Yeah. So while you are a new team you have assembled, you’re still operating in a bigger organization. But I know your goal was to stay more startupy and the best startups are always keeping an eye on time as well as money. So how did you hold yourselves accountable? Lisa Doan: When we first started we…this was a huge challenge for us. We went out and started to do research, but it became this endless research thing and there was no one asking us…well people were asking us when are you gonna build, but we couldn’t tell them. We had no idea. Everything was just so vague and open at that point and so we introduced a concept, which I believe comes from the lean startup of metered funding. And so in the startup world, you’re only alive as long as the money is there and so you’re always trying to convince your investors that they should continue to give you funding. In the enterprise world that doesn’t really exist. You have a team, there is funding for you already, and so you just continue using that and there isn’t anyone whose making sure that you’re making good on it. And so we introduced what we call a growth board. And so we have some stakeholders within Pivotal across different business organizations who will meet with us every six weeks and will hold us accountable to our learning. And so every six weeks we show up and we say this is what we learned and that’s how it’s affecting our direction. And they make the decision on whether we should pivot, persevere or kill the product. Poornima Vijayashanker: So it’s great that you’re following this framework of pivot, persevere and kill, but let’s get real here. I’m sure there was a time where you felt like, “Is there ever gonna be a light at the end of the tunnel?” And if so how did you reinforce or remind people of these best practices? Vera Reynolds: Oh yes, there were times. And I haven’t been with the team for as long as Lisa has so I’m sure she has even more times that she can conjure up, but for me there were definitely moments where I questioned what we were doing, I questioned why we were doing it and that’s where that balanced team really shone because it wasn’t just me from my engineering perspective. It was having those question, I think having designers, PMs and testers with us was really…we were up lifting each other and helping each other move along and get through those tough spots. Poornima Vijayashanker: Lisa, anything you wanna add to that? Lisa Doan: Yeah, there were definitely a lot of times where we were just really concerned about, is this even the right direction? What are we doing? There was so much ambiguity and that’s an extremely uncomfortable place for many of use. The place we came from is, we thought of features and then we built them and there was this security in it. And the new world we were in is, let’s go find problems, let’s validate those problems. And the practices were new, it was a huge cultural shift. You’re asking people to do things that are outside of their role. And so there was a lot of just stress for the early months and just trying to figure out, is this even viable? Are we even doing the right thing? Was this all just a mistake? Poornima Vijayashanker: And so how did you put that team together? Lisa Doan: Well like Vera said, we had great people on our team and we still do and we hold each other accountable to our learnings. And so fortunately having all these different perspectives can bring a lot of light. And so sometimes as a PM, if I’m very down about something then the engineers can bring a point like, “Oh but the user said this in this one user interview.” Which is something we never had before. Lisa Doan: But now they’re involved and they can bring up just as much evidence as I can and it’s extremely helpful when times get difficult. Poornima Vijayashanker: Yeah. So it’s having another, basically set of eyes and ears to pinpoint things that might have gotten overlooked. That’s awesome. I know you’re currently in beta, but let’s switch gears and talk about some of the positive outcomes that have resulted from doing this new product. Lisa Doan: Absolutely. We’ve seen a tremendous cultural shift, not just in our team but across the broader Tracker team as well. And so as I mentioned, we came from a veery engineering centric place and so we started to see the other teams start to adopt a lot of lean practices as well. Another huge benefit is, as soon as people started to see us start to get momentum they saw that it was directly related to having a vision and mission. And so now those teams have also gone out and established their own vision and mission which is helping to drive their futures forward and their work forward as well. Poornima Vijayashanker: And last time we talked about stakeholders. So coming full circle, how do they feel about this? Lisa Doan: They’re really excited. Our growth board is really enthusiastic and supportive of us. They’re also able to connect us to different parts of the organization, and so we’ve seen tremendous outreach from different parts of Pivotal that are very interested in what we’re doing and very excited to join and help us. And so that’s been a wonderful outcome of ours so far. Vera Reynolds: They still keep us on our toes. Vera Reynolds: It’s good to have that positive energy. Poornima Vijayashanker: I know you’re in a beta phase right now. How are you going about testing? Lisa Doan: One example I can give, is just last week an engineer and I, we walked over to someone on a different team and we asked them to use our tool, and we sat there and we observed them going through the various steps, and just cringing as they get to steps that are like, “Ooh we gotta clean that up, we gotta fix that.” But also seeing that it helped them in their day to day jobs and that was really exciting. Poornima Vijayashanker: Yeah, so doing some usability testing. Poornima Vijayashanker: OK. Anything else? Lisa Doan: We’re continuing to do evaluative research and so that’s making sure that they’re not just on our very specific persona, but we’re validation that the problem exists beyond just that persona and how we can potentially solve for various scenarios. Poornima Vijayashanker: I know we’ve covered a lot and there’s probably a lot more we can talk about when it comes to new products and staying on track. What’s one thing you would love our audience to just always remember. Vera Reynolds: I would just say if you’re engineers, question what you’re building and question your PMs. Poornima Vijayashanker: No that’s great. Alright well thank you both, Lisa and Vera for coming on the show and sharing some of these awesome best practices. Lisa Doan: Thanks for having us. Well that’s it for today’s episode of Build. Be sure to share this episode with your friends, your teammates, and your boss and subscribe to our YouTube channel to receive more episodes of Build. Ciao for now!